Bottari Lattes prize ceremony. Morten Brask with writer Javier Marias and Caterina Botari Lattes. 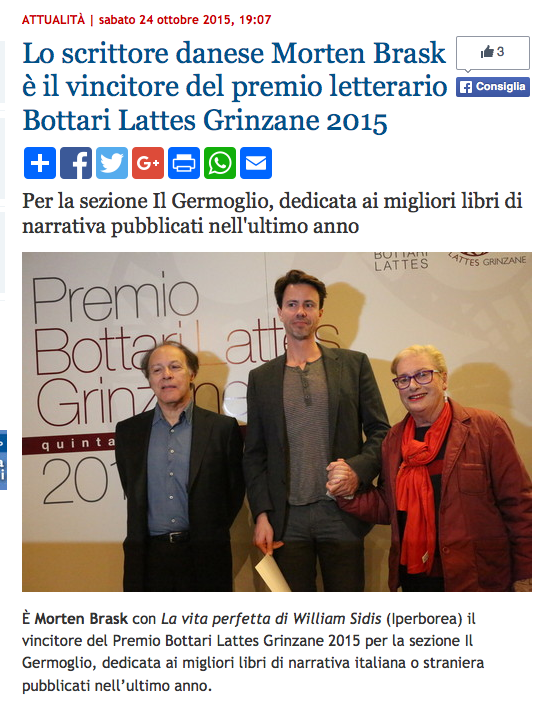 Morten Brask was the winner of Bottari Lattes Grinzanis literary award 2015 for the novel: “The Perfect Life of William Sidis” (La vita perfetta di William Sidis). The price ceremony took place at the medieval Cavour castle near Torino, where the Bottari Lattes Grinzane foundation has been awarded Italien and internation writers since 1982. The award is dedicated to discover innovative works of fiction.